Victory Racing Camp is a Christian faith-based summer camping program that teaches family values to teens from all walks of life. We use racing as the means to get teens out of their daily mindset, challenging them to excellence on and off the track. We want to make a difference in the lives of teens. We know they are smart, want to be challenged, and have a great capacity for understanding and compassion. However, teens struggle with identity, with fitting in, and with unfortunate things that may have happened to them in their pasts. Sometimes, these are just small fears that raise up in moments of insecurity in an otherwise happy life. Other times, these are fears that haunt their every moment. 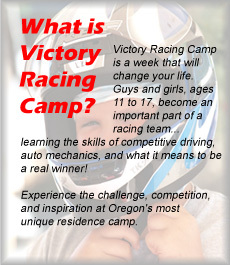 Victory Racing Camp goal is to work with all teens, meeting them where they are in life, and showing them that they can do things they never thought possible. That they can achieve, learn, communicate, fit in, and be appreciated for who they are. Support the individual by challenging them to reach beyond themselves, stimulating self-confidence, moral strength of character, and hope based on biblical principles.